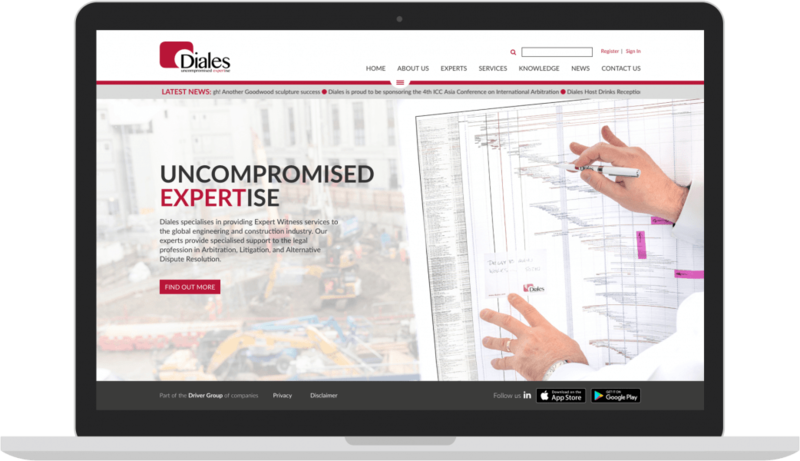 Diales specialises in providing Expert Witness services to the global engineering and construction industry. Featuring a clean UX, with a beautifully responsive framework and design, this is an excellent example of a modern corporate website. 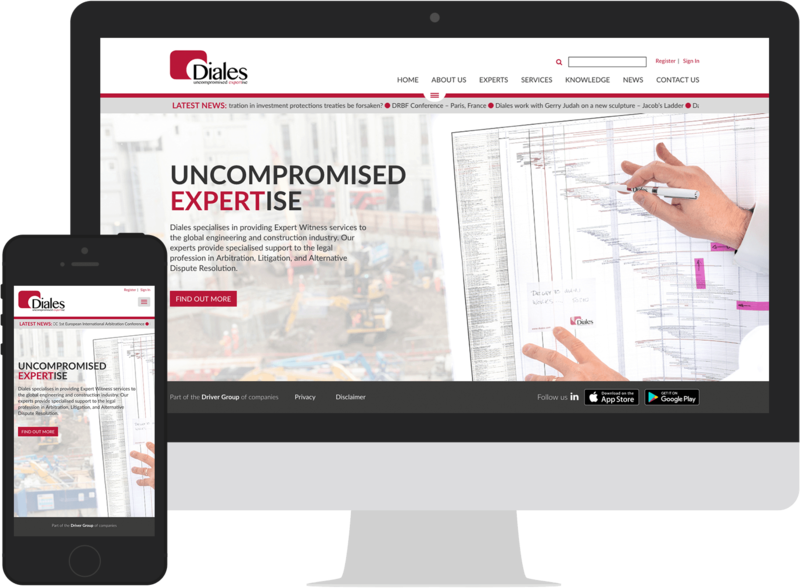 As a part of the Driver Group of companies, the Diales site required a concept that fitted in with the group’s image, whilst maintaining its own refined identity. Using clean lines and local navigation, this website features a refined UX that allows any information on the site to be accessible within 3 clicks and delivered in a clear, engaging manner. The framework is completely bespoke and responsive, from desktop all the way down to mobile, and remains easy to use on any device. With advanced graphics compression, complete caching and intelligent rendering, the pages load quickly – even on slow connections. 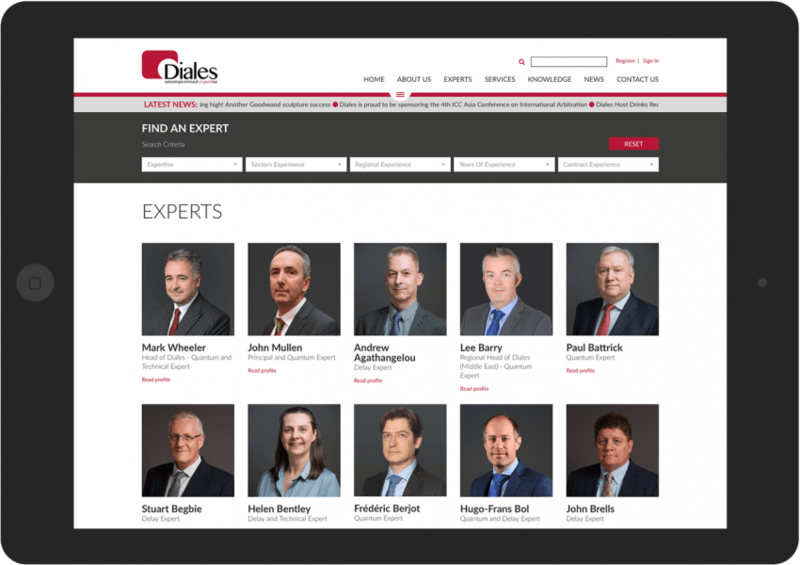 The Diales site also features a bespoke AJAX search system for the CMS, which promptly renders the results on-screen without exiting to a new page. Multiple search criteria can be selected; as this happens, the system automatically updates the results in real time, without any requirement for further input or delay. Running on the popular and easy-to-use WordPress CMS, the site is quickly editable for the client. As with all our sites, the functional systems were built specifically for this project and we avoided the use of third-party plugins. This avoids any extra baggage on the website when it is loading. The Diales website is fully responsive, from mobile through to tablet and desktop. As the website resizes by percentage, it automatically fits any screen size and has a consistent user experience across all platforms and operating systems. The user-friendly CMS allows all content to be paired with custom field-sets, so that it is fully editable. This includes all search criteria and meta tags on the AJAX search system.